Patricia Walsh, Ph.D.; Larry Bernard, Ph.D., and Leland C. Swenson, Ph.D.
148 undergraduate students acted as mock jurors in a study that manipulated the following variables to assess their influence on Subjects’ determination of guilt and sentencing severity of a criminal defendant: race of defendant, social economic status (SES) of defendant, race of victim, and credibility of defense attorney. A chi square analysis of the relationship between the four independent variables and verdict found defendant SES and attorney quality/credibility to be significant. A 2 x 2 x 2 x 2 anova for sentence length found a main effect of attorney quality and a significant interaction between defendant race and SES. A factorial anova on the projected likelihood of the defendant to commit a criminal act in the future found main effects for defendant SES and attorney quality. Factor analysis of a ten-item semantic differential questionnaire found that subjects rated defendants of high SES as having significantly more integrity than defendants of low SES. 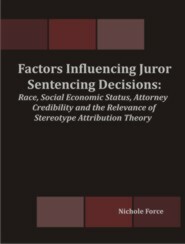 Support for stereotype attribution theory, which asserts that much racial stereotyping derives from an inference of social class, was found.